After spending a fair bit of time on Caroline Hirons' blog I released that my current skincare was just not up to scratch. My skin hasn't been feeling amazing for a long time, but I've always put skincare on the back burner due to my cursèd dermatitis. Because of this, I had a good long google before I bought anything, and there are still a few bits I've yet to buy until I know they'll get on with my face (an acid toner and eye cream, for example). La Roche-Posay Serozinc: I first heard about La Roche-Posay's Serozinc a long time ago, when it only used to be available in French pharmacies. It does all kinds of good stuff (I'm currently using it at the toner stage after cleansing), but most helpfully for me the zinc content helps heal any nasties in the nick of time. For example: Last week a got a huge under-the-skin spot on the side of my nose, where I get them all the time, and and all the time it takes literally nearly three weeks to shift. It's been four days, and it's almost completely gone. Miraculous. It's a bit like in really fancy plasters which are often metallic-- the zinc kills bacteria. Una Brennan Superfacialist Rose Peaceful Skin Night Cream: Like most people, I like to put on a slightly heavier, more pampering, moisturiser in the evening. I've heard loads of amazing things about nearly everything in the Superfacialist range-- the cleansing oil being one I want to try imminently--but even so, I did find myself pleasantly surprised by how lovely this moisturiser was. The actual product itself isn't super dense and heavy (in my dry skin struggles I've encountered some mighty lardy moisturisers), but it's definitely nourishing and feels like it's getting deep down into my skin and doing good. Equally, I'm not sure what's happened but lately I keep finding rose-scented things popping up all over my life. It's a bit spooky, but actually rose oil is great for skin so I'm putting up with my rose haunting (I'm not a real fan of the scent). It helps with reducing irritation and retaining moisture, and I'll be honest-- the smell does make me feel sleepy. I feel like rose is a bit of an old-lady scent (sorry, Nan) but I like to imagine I'm the Dowager Empress from Anastasia when I put it on and it helps me get through. To everyone else out there who actually likes the smell of roses (i.e. isn't crazy like me), this should be a no brainer. Get it, love it. Oskia Renaissance Cleansing Gel: Where do I start. Ok. This purchase was the one I really thought I was going to love. Obviously, in Blogger Land, there are a lot of products that get over hyped (Bondi Sands gradual tan for instance, or most Charlotte Tilbury things). I wanted to try this cleanser for a long time, and for a long time I was wary of the hype. All the people who claimed to love this cleanser also loved the Emma Hardie Cleansing Balm in their droves six months ago, and the Liz Earle Cleanse and Polish six months before. They swore it was their holy grail, the best ever, they bought backups of it in case of emergencies, etc etc. Personally, I have struggled with cleansers in the past and so I wanted to make sure that I wasn't going to be jumping in. I was patient, I was cautious, I was thoughtful... And then I saw Caroline Hirons post it on her blog and I ordered it straight away. Ugh, Hirons! She has power over me. Anyway, long story short. I haven't been blown away. It's been about two weeks and actually I don't think that any change in my skin has been down to it. It doesn't really feel as intensely, miraculously nourishing and I had heard, and the parma violets scent is just not down my street whatsoever. It hasn't caused any irritation, which was my main concern, but it also hasn't performed any of the miracles I feel I was promised. Blogger hype strikes again, probably a 4/10. Vichy Aqualia Thermal Dynamique Serum: To be honest, I think like a lot of people, I think that some skincare routines can just seem a bit 'much'. I think there are two or three youtubers I watch and I just think, wow, who has the time? 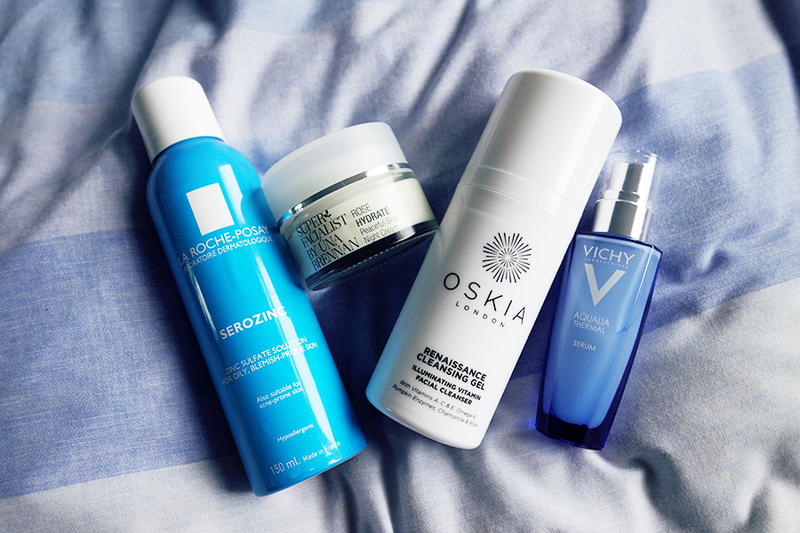 For a long time serums haven't really been too much of a priority for me, despite all the amazing things I've heard about the Kiehls Miracle Concentrate, the Estée Lauder Advanced Night Repair and all sorts of others. However, now that I've learned their role in the skincare chain, I'm a bit more happy to use them-- and actually, now I've got one and understand what it's doing, I'm even thinking of branching upwards to a fancier, harder-working one. Basically, what I always thought was that skin serums were like hair serums, meaning that it's the last stage in your routine after all the cleansing and moisturising et al. However, what I have come to learn (thanks google/Caroline Hirons) is that they really only work before your moisturiser, after cleansing/exfoliating. They add in all sorts of targeted goodness for whatever is troubling your skin as well as adding moisture back in to your skin before you seal it all off with moisturiser (figuratively). Not really sure how this compares to others as it's the first I've ever used, but it smells nice and seems to be doing good so I'm sticking with it for now.